Gotham Just Delivered A Huge Shock, But Will It Stick? Spoiler alert for the midseason finale of Gotham below. Season 2 of Gotham may be subtitled “Rise of the Villains,” but the show has had very little trouble making those villains fall back down after their rise. And tonight saw one big bad taking down another one in cold blood in a moment that truly shocked me. That’s right, The Penguin finally got his revenge on the malicious and two-faced (but not Two-Faced) Theo Galavan, which means Gotham City is totally going to be safe now, right? Doubtful, and that’s also assuming this is the last we’ve seen of Galavan. The mayor-to-be was barely even hiding his evil side in the past few weeks, which hinted that he might not be sticking around Gotham for as long as his power-hungry personality would have us believing. But he was still such a huge presence in the first half of Season 2 that his death tonight was just as discouraging as it was surprising. I expected more to come from his relationship with Tabitha, and while the Monks of San Dimas (or whatever they’re called) is still just weird, I thought he’d be leading their charge on other devious missions. But I guess nobody can survive crossing both the Penguin and Jim Gordon. While the Galavan of the past few months won’t be around anymore, we may see some altered version making an appearance in the future. The episode ends with Galavan’s body – complete with an umbrella shoved down his throat, which was a wonderful image – being taken into the Indian Hills facility, where one of the lab coat-wearing scientists says that Dr. Strange has high hopes for him. What we know for sure about Indians Hills is slight, but it’s a top secret facility where bizarre experiments are happening. Do those experiments involve resurrections? Do they involve turning living people into monsters? How will Galavan fit into it, and will anyone be using that umbrella for personal use after it’s removed from his body? We want answers! While we’re not sure of all the ways Galavan’s death is going to affect the good and the bad in Gotham City, it furthered the relationship of Penguin and Gordon. By interrupting Galavan’s beating by shooting him dead, Gordon once again proved that he doesn’t mind doing outwardly horrible things if there’s a worthy purpose in his mind. And here, he was not only saving Gotham from having a lunatic as its political leader, but also showing sympathy to someone in horrible pain. In my mind, Penguin should have kicked him a few more times simply for killing off Jerome, and then he should have kicked Gordon for interrupting him. The episode ended on a pretty sweet scene in which Mr. Freeze makes his first appearance, which hopefully means Galavan’s absence will be less noticeable when the show returns, because villains, villains, villains. 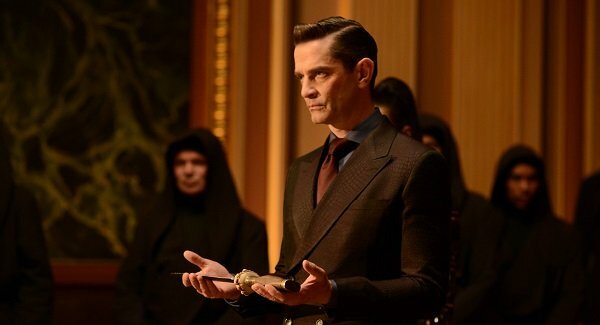 I’m perfectly willing to make that trade, even knowing how fantastic James Frain has been. Gotham will return to Fox on Monday, February 29. Let us know below what you thought about the shocking death. Are You Glad Theo Galavan Was Killed Off?